Sensitivity or injury in the wrists is unfortunately very common among yogis, and if you are one of the unlucky ones, you'll know how much it can influence your practice! When the wrists are out of the picture, it seems like all poses are all about the weight on the hands. Personally I watched and waited for 2 years before I was able to put weight on my wrist again after my beginners enthusiasm went too far. So if you are feeling some tenderness in your wrists, take it easy and modify poses until you are feeling better. Below are some ideas on how to modify five different poses for sensitive wrists. You almost cannot avoid this pose during a yoga class, so it's nice to find some alternative for your Down Dog. Depending on how your wrists feel, the pose itself may be a mild enough angle to be okay for you. If not, you can come down to your elbows for a Dolphin Pose where the weight is on your forearms. If you have access to specially formed blocks, like the Three Minute Egg blocks, you can use the slanting sides of the blocks under your hands, providing a more gentle angle for the wrists. Always make sure you are feeling stable, and do not attempt to put too much weight on your hands when leaning on blocks. This pose puts the wrists in a very tight 90-degree angle, which can be painful. You can adjust by lowering down to your knees, which will take the pressure off the wrists a little bit. 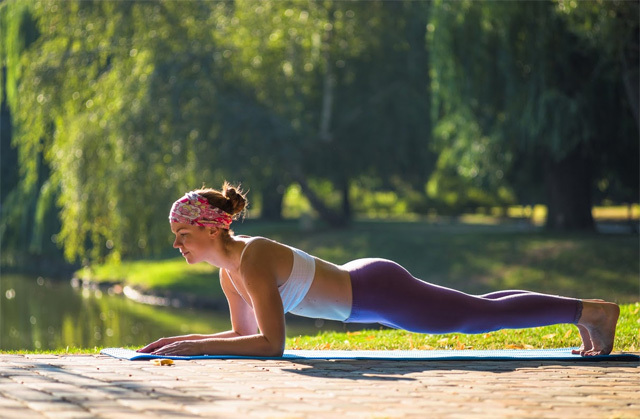 If you want to stay in a Plank Pose, lower yourself down onto your forearms. This will still work your core and upper arms, while your wrists are not affected. You can also use some props if your wrists are feeling okay for some weight-bearing action. Roll your yoga mat under your hands to provide a small cushion, or use a separate rolled up mat for this. Place the heel of the palm on the rolled up mat, and the fingers on the floor. This will soften the angle of the wrist, which will usually provide a lot of ease. If you have weights or dumbbells with handles available at home, you can take a hold of the handles instead of having your hands flat on the mat. This will keep the wrists straight. In poses where the hands are in a 90-degree angle, but are not bearing too much weight, you can place your fingertips on the ground instead of the full palm. When warming up the spine in the Cat and Cow movement, try this with fingertips. Start with shorter periods of time though, as your fingers might not be used to the weight. You can also try forming a fist with your hands so that the wrists stay straight. Only practice these options with poses where there is not too much pressure on the hands! This may seem like an impossible pose when you have pain in the wrists, but you can quite easily practice it with a yoga buddy. I was able to do this pose even when just leaning on my wrist was too much. Ask someone to assist you, and as you are laying down, ask them to stand close to your shoulders, facing you. You can then take a hold of their ankles, fingers pointing down. As you come up, press onto your buddy's ankles. Alternatively, you can always be in bridge pose while healing your wrist injury. If Upward Facing Dog Pose is too much for the wrists, you can try a gentle Cobra Pose while allowing minimal weight on your arms. If you'd like to spend some more time in a back bend, try Sphinx Pose from Yin yoga, which allows you to have the weight on the forearms instead of the wrists. When you start putting more weight back onto your wrists, start slowly. You can easily observe how your wrists are feeling when you are leaning against a wall. You can do gentle push-ups against a wall, letting the wrists get used to some weight. Some injuries seem to heal extremely slow, but the time waiting and modifying is not in vain. It teaches patience and it reminds us how yoga is more about the function and purpose of the poses rather than the form of the poses. Not being able to do a pose we want forces us to reach inside to find what really works for us, regardless of what others are doing.